I have to agree as well. 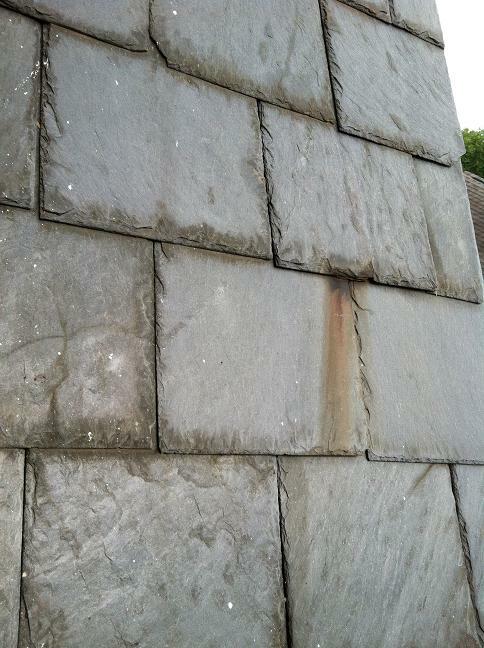 I installed several chinese slate roofs in florida years ago and from what i hear they are all looking pretty bad. They seem porous and cannot be cut or punched with traditional tools. Like kurtis says use them to fill holes. 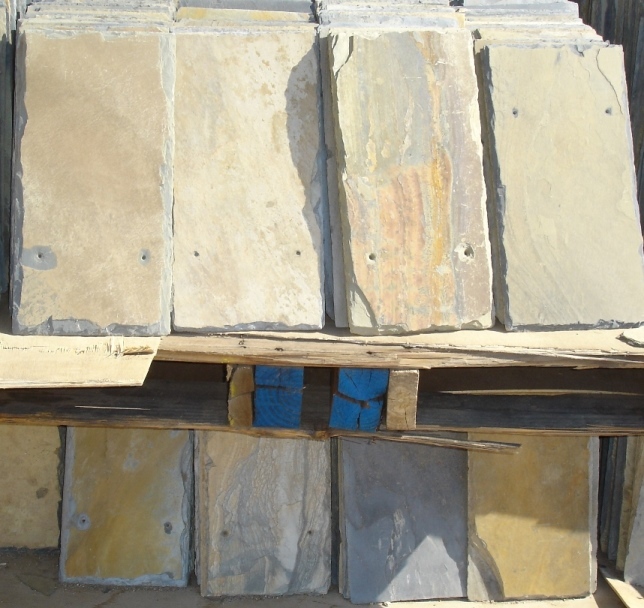 Ive cut them into floor tiles for outdoor patios as well but dont consider putting them on a roof. Btw they look exactly like what i got from american slate company years ago. They used to call it "china multicolor". I'm looking at buying SW Se green Vermont Slate Grade S1. Is this Slate good for Flagstaff extreme freeze thaw ice conditions? Thanks guys for all your help and advise. I was about to put the grade s3 slate on my roof. I'm afraid Kurtis is right. 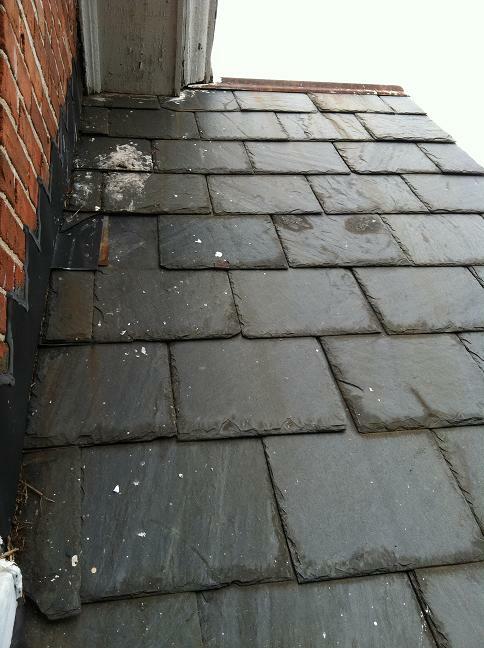 That slate is not worth installing in a cold weather climate. We've torn off a couple of S-3 Chinese slate that were installed after just 2 years. Both roofs had to be torn off and re-slated with a high quality slate after 2 winter cycles. My guess is that they were bad after the first winter, but that the underlayment kept the water out until there was just too much water coming through. So the leaks weren't noticed until the 2nd winter. Break them up and fill holes with it. get slate from a domestic quarry with a track record. I think you answered for yourself when you said you got them off "some contractor" who doesn't know squat. john how long would these slates last in a freeze thaw climate is they are a grade 3 slate? I already have them. I know grade 1 slates can last 150 years or more and grade 2 can last 50 to 100 years. If these are grade 3 slates will they last longer than asphalt shingles or will the freeze thaw cycle break them up quickly. Looks like a slate from India to me, but I'd have to see it in person. Pretty sure you're looking at an S-3 slate that would fall apart in freeze/thaw cycles. There's also a Chinese slate that similar to this. In fact, it's on a house around the corner from where we're working right now in Colorado. Either one of them aren't very good for freeze/thaw. Does anyone know what kind of slate this is or better yet what grade are they? I purchased from a contractor who doesn't know. He guessed China but just a guess. "bucks" will also have a slight greenish tone to them, though they are gray. They also last one hell of a long time and they don't flake or shed layers. I think that is what you have, good JOB!! If that is true, I would definitely fix the broken areas and redo the flashings, not only for yourself, but for the future owner(s) of the home up to 100 years in the future. Done correctly, that will last a looonnggg time. Thanks for providing the video. I can see the glitter in your video, but not on any of the pieces I found at the house. My wife says the glitter is on the roof, but not on the ones we found laying around. Maybe the replacement slates are a different type from the original roof. I'll try and carefully lean out a window next week to get a better view. By the way, my wife loves the idea of a copper or metal roof over the porch. Probably Buckingham slate. Find a broken piece and hold it in direct sunlight. It should glitter. Thanks for the input guys. A copper or metal roof does sound like a better idea for the porch area. Still searching for a reputable roof inspector in the area. Spoke to one today who wanted to walk on the roof as a part of the inspection and I immediately got off the phone. Experts in this area are tough to come by. As far as the restoration, I would redo all flashings with copper. The slate looks good. I would not install slate on that porch and would install flat lock copper first or the standing seam roof that Old School suggested. If that is the original slate on the house, whatever it is in in great shape! It could possibly be Buckingham Virginia if that is the case, and that would make some sense as you are quite close to them in North Carolina. It has held up well too considering that they have been up on the roof when they painted the house. The pieces of metal rusting and sticking out from beneath the slates are the clips someone used to repair the slates. A nail and bib or better yet a slate hook would be a lot better way to fix them. those should be able to be removed and a slate hook inserted if they are not all cemented up. I would re-consider using slate on the front porch. It is too flat for that and that is probably why they redid it in the first place. i would recommend a copper standing seam roof, or at least some type of metal. Being that flat people are going to walk on it anyway and you will have constant repair problems on it if you install slate. Just my opinion! I think if I was to work on that one, I would treat the whole house as a unit and prioritize everything before I started. Anything from the eave line up should be worked on at the same time. 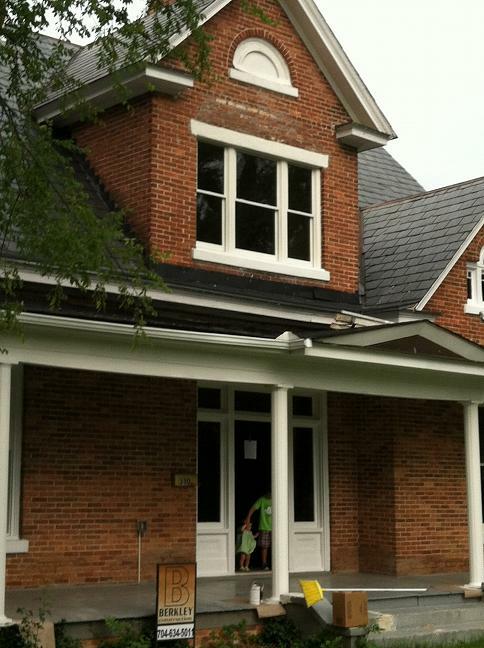 Painting, brick pointing and flashings should all be fixed at the same time the slate is being repaired. No sense fixing the slates and then having the work destroyed by the others. My wife and I are contemplating purchasing a home in Lincolnton, NC built in 1871 which is in the process of being completely restored. Everything which has been restored appears great, but I'm a little hesitant about the roof. The guy restoring the house says he thinks the roof is Bangor Blue Slate. I'm a little skeptical but have a hard time identifying the different types of slate because I'm colorblind. We've been in the house during a torrential downpour and there were no leaks I could see, and I went in the attic. 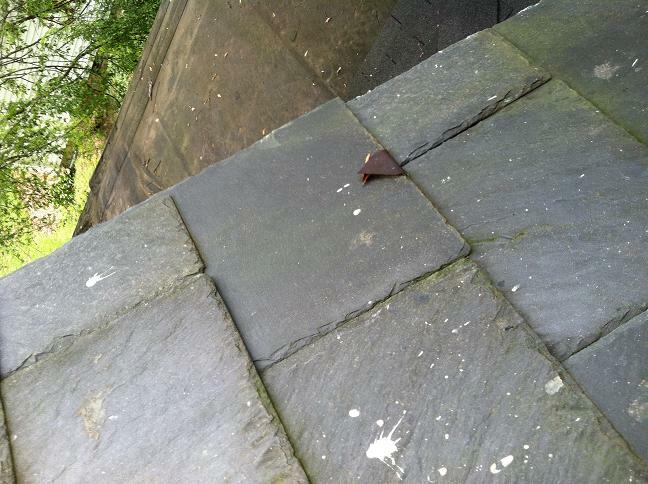 The flashings appear quite rusty and old, and there are a few metal hooks on slates which are probably replacements. 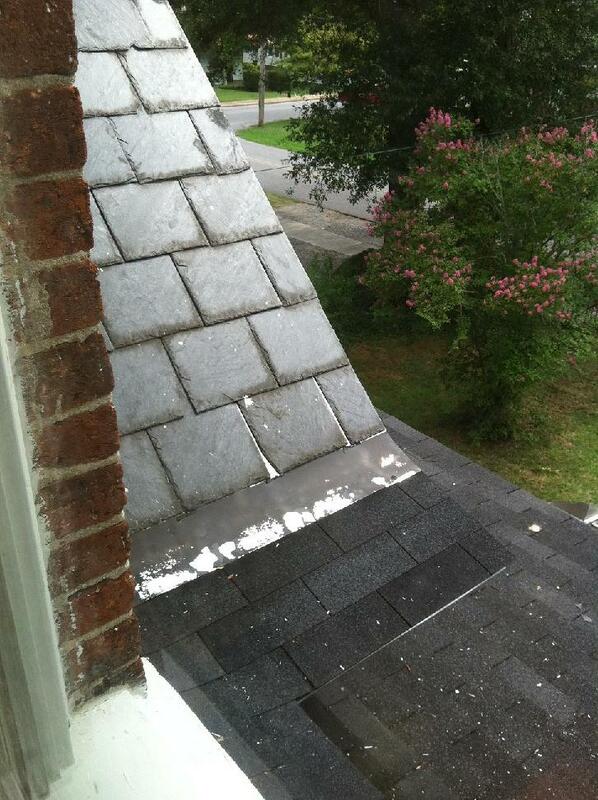 I would eventually replace the asphalt shingles over the porch with slate. By the way, I've ordered The Slate Roof Bible and look forward to reading it. Below are a few pics. Any help would be appreciated. Also, looking for recommendations for a solid slate roof inspector near Lincolnton, NC (45 min northwest of Charlotte).